373 Marlborough is located on the north side of Marlborough, between Hereford and Massachusetts Avenue, with 371 Marlborough to the east and 375 Marlborough to the west. 373 Marlborough was built in 1879-1880 by Vinal & Dodge, masons, for building contractor George Wheatland, Jr., for speculative sale. It was one of three contiguous houses (369-371-373 Marlborough) built at the same time and one of twelve contiguous houses (369-371-373-375-377-379-381-383-385-387-389-391 Marlborough) built for George Wheatland, Jr., in 1879-1881. He is shown as the owner of 369-371-373 Marlborough on the original building permit application for the three houses, dated December 4, 1879 (one application for three houses). 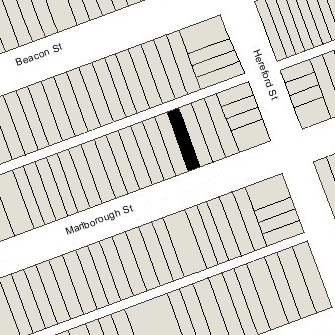 Click here for an index to the deeds for 373 Marlborough, and click here for further information on the land on the north side of Marlborough between Hereford and Massachusetts Avenue. On November 15, 1880, 373 Marlborough was purchased from George Wheatland, Sr., by retired grocer John Lucas Emmons. He and his wife, Caroline Draper (Vose) Emmons, made it their home. They previously had lived at Burroughs Place. Caroline Emmons died in January of 1882, soon after they moved to 373 Marlborough. John Emmons continued to live there with their unmarried daughters, Mary Blake Emmons and Helen Pickering Emmons. Mary Emmons married in June of 1885 to George Woodman Wheeler, a widower. They lived with her father and sister at 373 Marlborough. George Wheeler was a wholesale dealer in paints, oils, and varnishes. Mary (Emmons) Wheeler died in April of 1892, and John L. Emmons died in April of 1894. 373 Marlborough continued to be owned by a trust established under his will. George Wheeler, his son, John Blake Emmons Wheeler, and his sister-in-law, Helen Emmons, continued to live at 373 Marlborough. On April 17, 1896, the trust established under John Emmons’s will transferred the property to John B. E. Wheeler. John B. E. Wheeler married in April of 1912 to Kathleen Page and they moved to Brookline. He subsequently became assistant treasurer of his father’s paint, oil, and varnish business, and in about 1915 they moved to Weston. George Wheeler and Helen Emmons continued to live at 373 Marlborough. Helen Emmons died in February of 1918. On October 14, 1918, John B. E. Wheeler transferred 373 Marlborough into his wife’s name. During the 1918-1919 winter season, George Wheeler was joined at 373 Marlborough by John and Kathleen Wheeler (who also continued to maintain their home in Weston) and Kathleen Wheeler’s brother, Lawrence Boynton Page. John Wheeler and Lawrence Page both were serving in the US Army. George Wheeler moved soon thereafter to live with his son and daughter-in-law in Weston. He died in August of 1919. By the 1919-1920 winter season, 373 Marlborough was the home of Harvey Hollister Bundy and his wife, Katharine Lawrence (Putnam) Bundy. In 1917, they had lived in Cambridge. Harvey Bundy was an attorney in Boston. He later would serve as Assistant Secretary of State under Henry Stimson in the Hoover Administration, and as Special Assistant to the Secretary of the Treasury (again Henry Stimson) in the Roosevelt Administration. The Bundys’ son, McGeorge Bundy, served as national security advisor to Presidents Kennedy and Johnson. 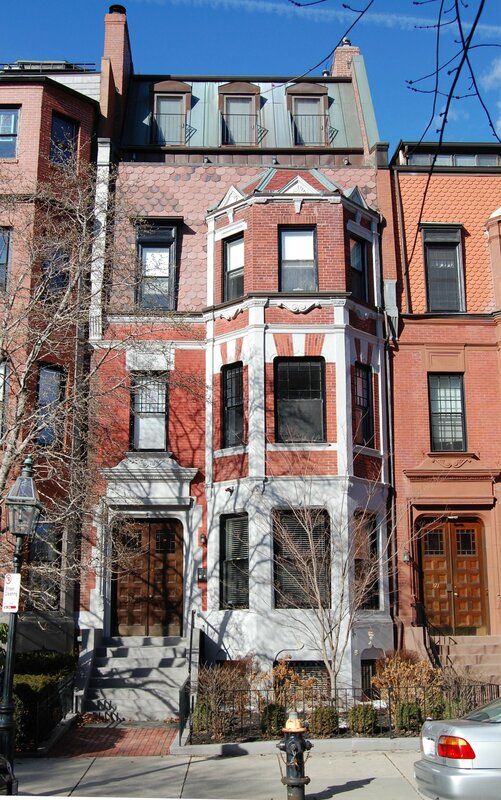 The Bundys continued to live at 373 Marlborough during the 1922-1923 season, but moved thereafter to 133 Beacon. On December 1, 1922, 373 Marlborough was acquired by real estate dealer William J. Stober (the property was conveyed by Lindsey K. Foster, an attorney, by a deed from Kathleen Wheeler dated November 4, 1918, but not recorded until December 1, 1922, simultaneously with Lindsey Foster’s deed transferring the property to William J. Stober). On January 31, 1923, 373 Marlborough was acquired from William J. Stober by Eda (Friedman) Hecht, the wife of wool merchant Simon Elias Hecht. They previously had lived in Brookline. They also maintained a home in Clifton. They continued to live at 373 Marlborough until about 1949, when they moved to an apartment at 256 Marlborough. On March 10, 1949, 373 Marlborough was purchased from Eda Hecht by Andrew Hartwell Elliott and his wife, Ethel Blanche (Carter) Elliott. They lived at 31 Park Drive. He was a civil engineer with the Department of Public Works. In March of 1949, Andrew Elliott applied for (and subsequently received) permission to convert the property from a single-family dwelling into four apartments. In May of 1951, the Elliotts also acquired 306 Beacon. Andrew Ellliott died in October of 1967 in Brookline. On July 20, 1989, 373 Marlborough was purchased from Ethel Elliott by Allen Bertram Schwartz and his wife, Ruth S. (Abrams) Schwartz, trustees of the Community Finance Company. In the same transaction, they also purchased 306 Beacon. On May 1, 1996, 373 Marlborough was purchased from William R. Haney, Sr., by the Brantam Corporation (Branka Milosevic, president). On March 16, 1998, Brantam Corporation converted the property into four condominium units, the 373 Marlborough Street Condominium.